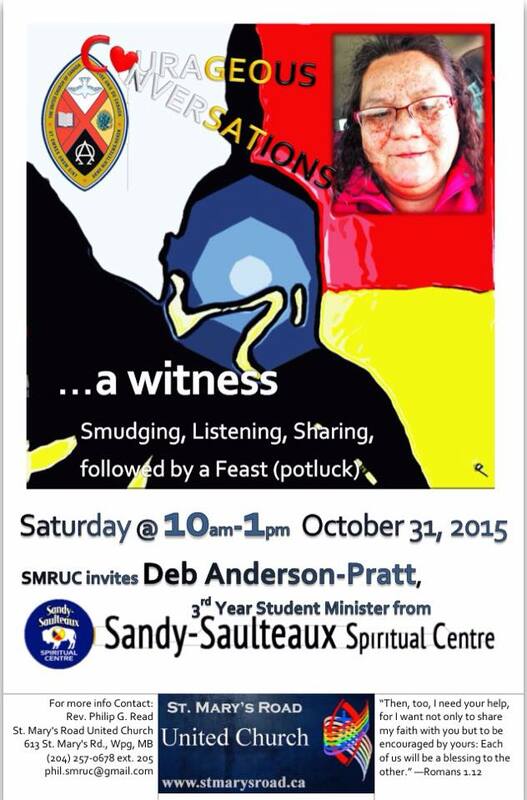 This is the poster for Deb’s event here at SMRUC. Deb is a student with All Native Circle Conference. She is mother of five, grandmother to twenty-one; a Cree/Saulteaux; and a Christian. On Saturday Morning Oct. 31st, Deb will share her story filled with many hard-aches and pain, but also joy and hope. Like our other events there will be a time of sharing and feasting, and will start with a smudge for those interested. “Courageous Conversations” are an ongoing events that seeks to explore, celebrate, and honour the fact that we are all Treaty People. But that requires understanding, and understanding requires dialogue and an openness to learn. Our first event was with Rev. McKay where he offered his understanding of the 7 Sacred Teaching & being an Aboriginal Christian. The Next one was with Speakers from the Treaty Relations Commission of Manitoba–Elder Bone and Aimee Craft. They share and educated on the history and (mis)understandings of Treaty relations.